The Hotel Turnerwirt is a family-runed enterprice on the outskirts of Mozarts City (2000 meters from the Centre).The Hotel with Villa and Atrium offers a comfortable stay for Individual and Group travellers. 70 elegant rooms, equipped with BathWC or ShowerWC, Telephone, Sat-TV (22 Channels), W-Lan. For Individual guests the Hotel offers BedandBreakfast, for groups starting with 20 persons the Hotel offers also halfboard. There are no elevators in the buildings, Free Wi-fi in all rooms + free Internet points, 50% of rooms are non-smoking-rooms, 2 rooms with wheelchair equipment at the Turnerwirt Atrium. Bus stop to Centre and Station direct in front of the Hotel. Free parking at Hotel for 60 cars and busses. 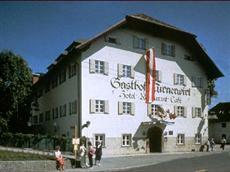 At the Reception of this traditional Hotel you get Information for Salzburg and suroundings as well as bustickets and Salzburg-Card. Also sightseeing-tours you can order here.